Hatch Green Chile Chicken Burgers, made flavorful with your favorite Southwestern seasonings and of course Hatch green chili peppers. Looking to switch up your Burger Game this Summer? This healthier burger recipe is oozing with green chiles and Southwestern flair. Plus tips on how to make the best chicken burgers. If I were to choose a “last meal” it would be a (beef) burger, grilled or pan fried, doesn’t matter, cheese not necessary, topped with onion and some mustard. It’s my favorite thing on earth to eat. But chicken burgers every once in a while never hurt anyone. Especially if it stuffed to the brim with my favorite roasted Hatch green chiles. How do you make chicken burger patties? Chicken burgers are always so “odd” in texture before they hit the grill…so odd and mushy that I’m surprised they don’t just fall apart before you can get them cooked. Adding bread crumbs to the ground chicken mixture seems to do the trick in securing a solid patty to place on that sesame seed bun. 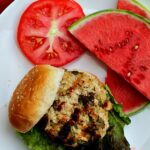 With cumin and green chile, we enjoyed the Hatch Green Chile Chicken Burgers recipe because the burgers cook up like a charm, staying nice and moist without losing that burger form. Buying ground chicken breast from the store is easy and readily available, but did you know that if you’ve got a couple of chicken breasts that need to be used, just pat them dry, cut in large chunks and put them in your food processor. Pulse until you have chopped meat. That’s what I did for these grilled Green Chile Chicken burgers. Which leads me to give you more tips about how to make the best ground chicken burger recipe. How do you make a juicy chicken burger? If not prepared correctly, chicken burgers can turn out dry and rubbery. Here are some tips to make a great chicken burger even greater. Mix fine chopped vegetables into the ground meat. 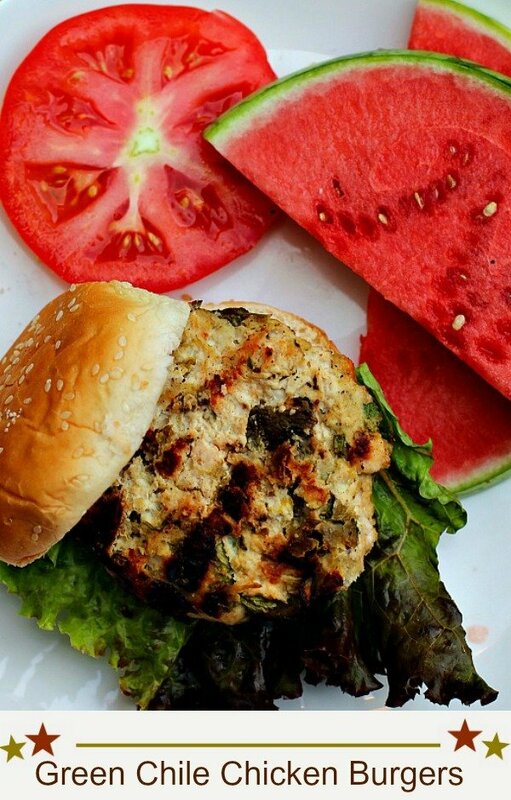 Vegetables have a high water content and will help bring moisture and texture to that chicken burger. Example. This recipe contains chopped Hatch Chile Peppers. It’s best to grind your own chicken breast. Packaged pre-ground chicken can contain fat, cartilage, and sometimes fillers. It’s so easy to buy boneless, skinless chicken breasts and pop them into food processor. Voila, ground chicken meat. Don’t cook them to death! Start with a high temperature to develop a sear, cooking about a minute or so each side, lower heat and finish cooking the burger. Remove your chicken from the heat one “doneness” before you think it’s done (for your preference). For example, if you like your chicken slightly pink, take your chicken off the grill when it’s a bit pinker, tent it with foil for about 5 minutes. It will continue cooking on its own. Add tomato and lettuce to your chicken burger bun, they will bring a juicy slice of moisture to the overall experience. Don’t have an outdoor grill? Use a cast iron skillet or grill pan to make these indoors. My sincere sympathy goes out to you if you don’t have roasted Hatch chile available. If that is the case, you can substitute those “Hatch” labeled canned chiles from the Mexican aisle at the grocery. And if you are using fresh roasted Hatch chile, remember, friends don’t let friends wash those skins off with water. Just scrape them off with your hands. If you rinse them with water, you’re washing away some of the smoky flavor. The French got involved for a delicious finish to this recipe. A mixture of Dijon and mayo made a great condiment for this burger. 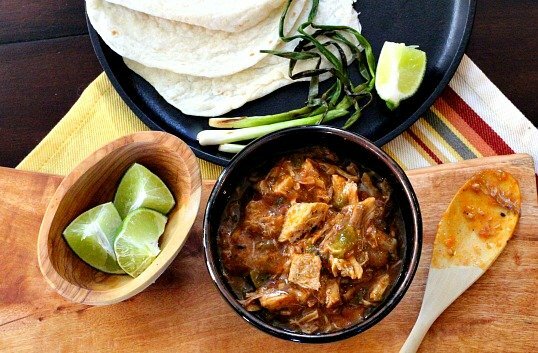 Are you green chile crazed? Take a look at the most popular and most classic chile recipe on my site, How to Make Hatch Green Chili, Colorado Style. I hope you give this unique Southwestern burger recipe a try. And if you do, please come back and let me know how you liked it and give the recipe a star rating. Your feedback is valuable to me for developing future recipes. 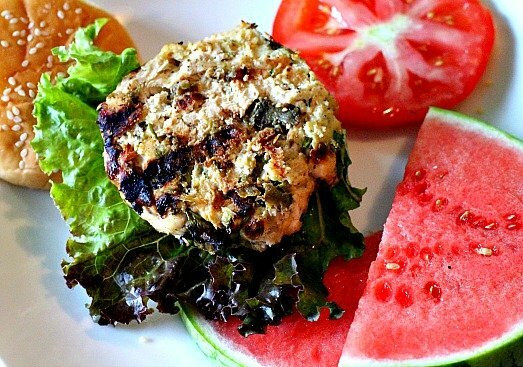 And if you have a favorite healthy chicken burger recipe, let me know, I’d love to give it a try. Recipe adapted from a Martha Stewart recipe = always reliable. Jazz up those Summer burgers with these Green Chile Chicken Burgers. Oozing with green chile and Southwestern flair. Heat grill to medium high. Combine chicken, cumin, chiles, chopped cilantro, bread crumbs and salt and pepper. Gently mix and divide into 4 patties. Brush grates with oil and grill burgers, flipping once, until golden brown. A meat thermometer should read 165 degrees. 8 - 10 minutes. Grill buns, just until toasted, about one minute. Serve burgers on buns with tomato slices, mayo and mustard mixture, and lettuce. 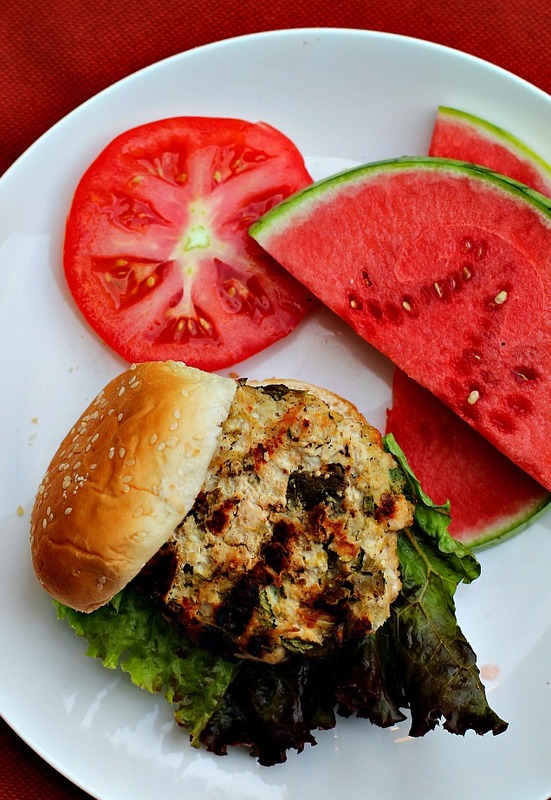 Hatch Green Chile Chicken Burgers … They’re what’s for Dinner. What a great recipe! I am very into ground turkey but have texture issues and never thought of adding bread crumbs. This is a game changer. Thanks! Martha’s original recipe didn’t call for bread crumbs, my idea. It seemed to work pretty darn good. I was just too afraid of that odd texture without. I’ve never eaten a chicken burger but this sounds very good. Green chiles make everything better and we plan to restock while out that way. If you’re coming in July, we won’t have any available yet. Signed Debbie Downer. I have never tried a chicken burger, probably because I’m not a fan of turkey burgers. However, this one sounds and looks delicious, so I think I’ll give it a go! I’ll take my beef burgers any time, but it’s nice to try something new. I know I’m missing out on something very special with those Hatch chilies! Wish I could find them here. What a great idea to switch up the burger menu and give it a Southwestern twist. They look wonderful! You can always order them. There are companies in NM that ship frozen. I go back and forth on washing the skins off my Hatch chilies. You absolutely do lose some flavor, but they’re already so flavorful that I don’t know if it matters much. I should do a taste test one of these days! Anyway, I love burgers too. And almost always beef for me. Need to try these chicken burgers. Need to wait until later this summer when I can get Hatch chilies again — I’ve exhausted my frozen supply! These look amazing. I am with you on Martha. I have almost all of her books and have never been steered wrong by one of her recipes. Me too – so far. Mm, this sounds so good! I love the side items you went with-very refreshing! Thanks for sharing the recipe! 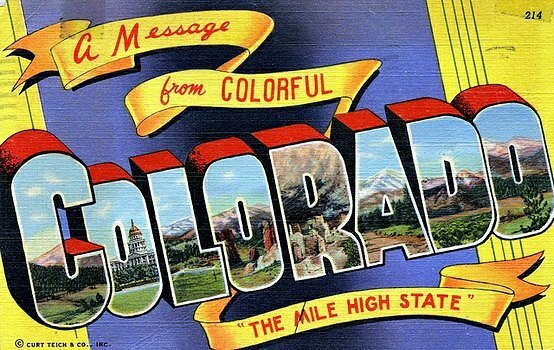 Thank you for mentioning Hatch Green Chile. We would love to send you a free box of our Hatch Green Chile as a thank you. If you’re interested, please send me an email with your mailing address. Im down for that! Looks yummy! Green chili anything is ok in my book!